The local forecast is calling for a big dip in the jet stream this weekend. This will drive cold air south over New York City and send temperatures plummeting from their above average readings. You may wonder, what is this meteorological phenomenon that is bringing winter back to the city so abruptly? Jet streams are bands of strong winds in the upper atmosphere that mark the location of the strongest temperature contrast at the surface. They are born out of the complex interactions among a variety of atmospheric conditions, including the position of warm and cold air masses, and the location of areas of high and low pressure. In the U.S., the polar jet stream, one of four major global jets, marks the divide between cold arctic air and mild mid-latitude air. Its position is a function of temperature contrasts and therefore shifts throughout the year, depending on the season. In the warm summer months the jet is typically located around 50° to 60°N latitude. In the winter, when temperature contrasts are increased, it usually shifts to the south. It has been known to plunge as far south as 30°N latitude. This winter, however, the jet stream has been staying well to the north with only a few arctic outbreaks so far. When they do come though, the sudden drop in temperature can be very jarring. 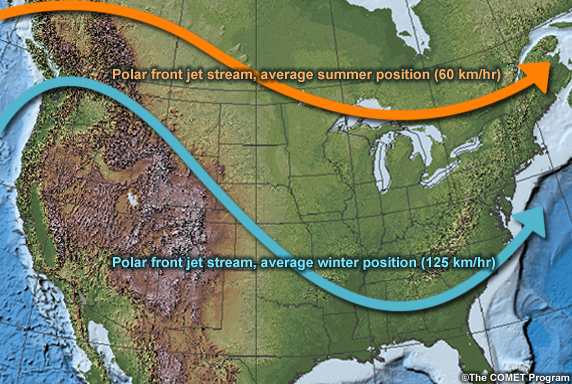 Average seasonal positions of the Polar Jet Stream in the northern hemisphere. This entry was posted in weather and tagged jet stream, seasons, winter by Melissa Fleming. Bookmark the permalink.